HondaJet Elite is equipped with a newly developed noise attenuating inlet structure. HondaJet Elite is being displayed for the first time to the public at EBACE from May 28 through May 31. HondaJet Elite is equipped with a newly developed noise attenuating inlet structure, explains the company, which lines each engine and greatly reduces high frequency noise to enhance cabin quietness. The new aircraft’s avionics system now incorporates additional performance management functions for flight planning and automatic stability and more functions to enhance safety of flight. The aircraft, being displayed for the first time to the public at EBACE from May 28 through May 31, is type certified by the U.S. Federal Aviation Administration (FAA) and the European Aviation Safety Agency (EASA). The new aircraft leverages aeronautical innovations developed by Honda Aircraft, including the Over-The-Wing Engine Mount (OTWEM) configuration, Natural Laminar Flow (NLF) fuselage nose and wing and composite fuselage. 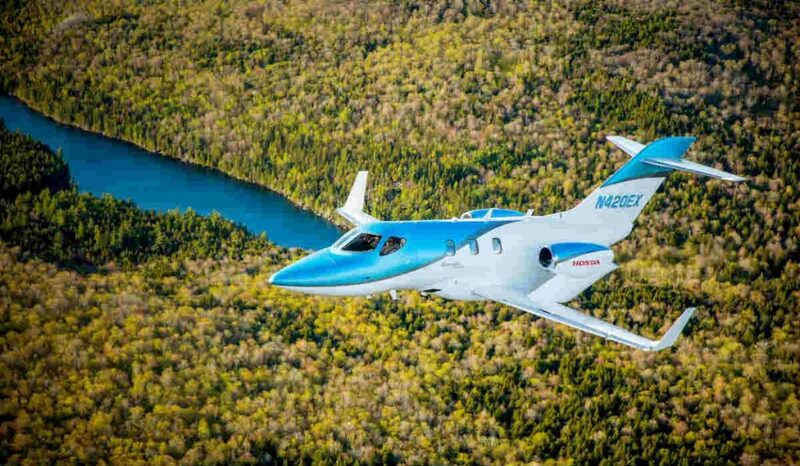 Honda claims that the HondaJet Elite is more fuel efficient than any other aircraft in its category and emitting less greenhouse gases than similar-sized business jets. In terms of avionics, HondaJet Elite provides new performance planning for flight measures such as airspeed, cruise altitude and fuel flow, as well as automatic computation of the required runway length, V-speeds, climb/approach gradients. As an option, owners can purchase stability and protection with Roll and AoA Functions, which are enhanced safety features for manual flying that will deter aircraft operation outside the normal flight envelope. HondaJet Elite also offers AFCS coupled go-around with underspeed protection as an option, which means the aircraft’s autopilot remains connected, enhancing aircraft safety and reducing pilot workload. New exterior colours can be applied with three signature paints, Ice Blue, Ruby Red and Monarch Orange, while an option Bongiovi Audio System can be applied in an speaker-less in-cabin sound system.